Detroit rap duo Twiztid have been in this game for a while now since their debut album Mostasteless on Psychopathic Records in 1997 rising out of the ashes of their previous group House of Krazees. It’s 2016 now, and with their own label Majik Ninja Entertainment in full swing, the demented duo of Monoxide Child and Jamie Madrox are ready for the next chapter in their long legacy with the announcement of their new album The Continuous Evilution Of Life’s ?’s, due out January 27, 2017. All the Juggalo homies out their were given the surprise announcement of the new album inside the booklet of the recent re-issue of their 2003 release The Green Book, which also includes a download card in the vinyl version for the first single off of The Continuous Evilution Of Life’s ?’s, entitled “Are You Insane Like Me?”. Twiztid have been vocal in interviews in the past year or so that their next album will have more of a hard rock influence into it, and even personally gave me some of the bands they wanted to work with or were inspired by. With The Continuous Evilution Of Life’s ?’s, they linked up with their longtime collaborator Seven to produce a majority of the album along with four tracks produced by goth rock frontman Davey Suicide along with his keyboardist Needlz. Twiztid recently announced their massive 2016 fall tour, The Spooktacular Horror Show, beginning on September 28 in Minneapolis, MN and visiting 30+ cities before coming to a close on Halloween night in Sauget, IL. The Spooktacular Horror Showtour will feature special guests Mac Lethal, Zodiac Mprint (Blaze and The R.O.C. ), Lex The Hex Master, Menage 2 Sobriety and Godz Of Kaos. 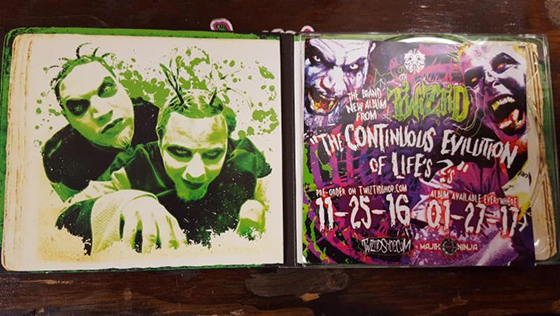 Twiztid’s new album The Continuous Evilution Of Life’s ?’s will begin pre-orders on Black Friday November 25th. For more information, visit twiztid.com.